The most significant scientific discovery of the last century was announced yesterday – physicists have finally detected gravitational waves. You may have already heard the news, but what you may not have heard is why this news is so huge. So important. To answer that question, we first need to understand what gravitational waves are. A central part of Einstein’s theory if General Relativity is that gravitational waves, ‘ripples in space-time’ are created by seismic astronomical events. Space-time is the term for the space-time continuum, a four-dimensional entity within which physical space and time are considered as one. Both space and time are relative to one another and Einstein proposed that space-time was actually a dynamic, changeable concept. He suggested that gravity can warp, bend and manipulate space-time. If you’ve seen Interstellar you’ll have come across this concept already (spoiler alert); when the crew land on Miller’s planet (with the very strong gravity and gigantic waves, sitting next to a black hole aptly named Gargantua) it seems that they are only there for a few minutes. For Romilly however, an astronaut who remained aboard the spaceship within the black hole’s orbit, 23 years had passed. This disparity in experienced time from one observer relative to another is known as time dilation. Time dilation actually happens all the time; if you stood on a stool next to a friend who was stood on the ground, time would actually pass slightly faster for you as you are further away from the source of gravity (i.e. Earth). Of course this effect is immeasurably small, but it does exist. Gravity can interact with space-time whenever mass moves or changes; for instance when a large astronomical mass is suddenly moved, two massive objects collide or a supernova explodes. Einstein’s theory of General Relativity proposes that these space-time disturbances produce gravitational waves. Much like the ripples in a pond, the more massive the object the greater the gravitational waves will become. When these waves pass through the universe, they can alter space-time. So do the waves exist? Einstein believed strongly in his theory, yet he never thought it could be tested. Most gravitational waves would, theoretically, be extremely small; only a massive force could create them at detectable levels. Fortunately, space is filled with massive objects, and physicists have developed a variety of methods in order to attempt to detect gravitational waves. The most promising of these methods is the half a billion dollar Laser Interferometer Gravitational Wave Observatory, better known as LIGO. LIGO is actually made up of two separate installations, 1865 miles apart – one in Washington and one in Louisiana. Each facility houses of a gravitational wave detector comprised of a 4-foot (diameter) L-shaped vacuum pipe with 4-kilometer long arms. The detectors are buried beneath the earth and are covered in concrete; this protects them from disturbance from the outside world but, as gravitation waves can penetrate all materials, allows the detectors to function effectively. Within the detectors are mirrors and ultrastable laser beams. In order to detect gravitational waves, laser beams are fired at a beam splitter, which cuts the beam into two. These beams are then reflected on the mirrors. Without wave interference, the beams will reflect off the mirrors and cancel each other out. If gravitational waves are present, however, the beams should be slightly off-centre when bounced back at the detector. The two separate sites are used in order to ensure certainty of detection. The waves are absolutely tiny (around a billionth of an atom) and so are extremely difficult to identify. Although the detector was set up in 1992, it is only new tests on the LIGO detectors conducted in the last few months which have finally revealed that gravitational waves really do exist. 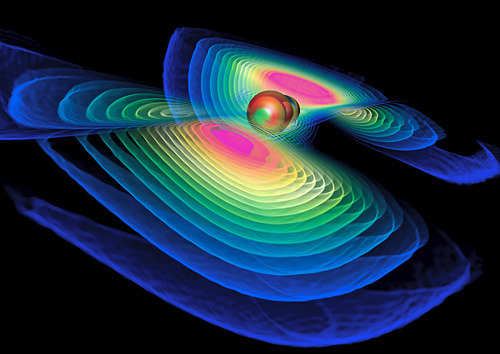 “What the observatory picked up was a minute gravitational distortion as the wave tripped the ribbon of laser light within LIGO’s vast tunnels.” Becky Ferreria. 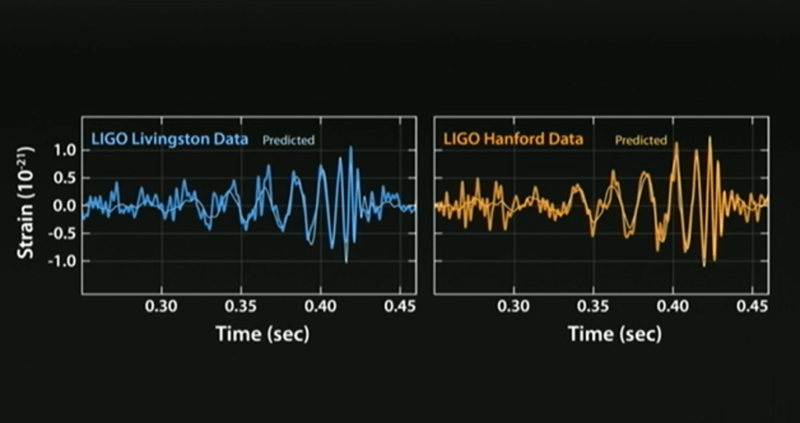 The data from the gravitational wave detectors, overlaid by predictions based on Einstein’s theory. Now that the experimental results have been officially verified however, the scientists responsible could be looking at a Nobel Prize. So what does this result mean for physics? It is a huge discovery with payoffs both for astronomy and physics in general. First of all, it will confirm the accuracy of the Theory of General Relativity, one of the most comprehensive and influential theories of the universe. For instance, the waves can now make us surer than ever before that black holes actually exist; after all, we’ve never seen one with our own eyes so we can’t really be sure. They can also help us to access more of the universe. Currently most of the information we receive from space comes in the form of light waves, radio waves and x-rays. With the introduction of gravitational waves, a completely different form of information, we will be able to discover a completely new universe. For instance, the waves could show us the birth of a neutron star and even reveal what happened at the very birth of our universe, the Big Bang – the ripples in space time would still be visible today. To find out more about LIGO, take a look at their website. You can also find out more about life near a black hole with this VSauce video. Previous Post 360 Degrees of Mars! of the finest sites on the internet. I’m going to recommend this site! Good info. Lucky me I reach on your own website by accident, I bookmarked it.